Hizb ut-Tahrir, a group so radical that the Muslim Brotherhood won’t even touch it, lives and breathes in America. Part of the reason it’s a fringe group in the U.S. is because it is mostly honest about its objectives. For example, one of its websites answers a question about the status of Christians in an Islamic State by frankly admitting that Sharia is imposed upon them and other non-Muslims. “Everyone who carries the citizenship of the [Islamic] state enjoys the rights and is bound by Shari’ah obligations,” the Hizb ut-Tahrir (HUT) website says. 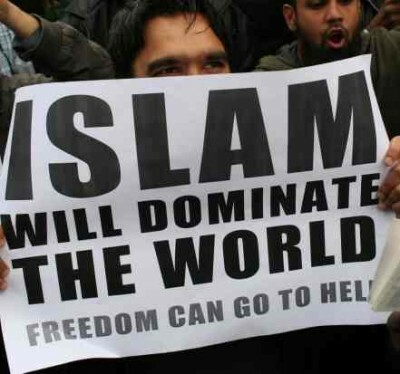 Of course, Islamists view this as a great aspiration, otherwise they wouldn’t believe in it. The article extols the fairness of Sharia-based governance. The “basic needs” of all Muslims and non-Muslims are guaranteed, income is redistributed and health care and education are free. Non-Muslims can even be appointed to administrative positions and file official complaints if they are abused by authorities, at least in a way that isn’t consistent with Sharia. The description sounds swell to those that don’t notice the important caveats. The HUT article, written by a spokesman in Lebanon, becomes vaguer when discussing the more sensitive issues. It was written in English for a non-Muslim audience, after all. On the question of Muslims who abandon the faith, it explains, “The rule of the apostate is applied upon those who have apostatized from Islam if they are apostates.” That means execution, but that isn’t exactly the loveliest word you want to use when promoting your ideology. Jihad is required for the Muslim population of this Islamic State, and non-Muslim participation in this jihad is encouraged. HUT says, “Jihad is an obligation upon the Muslims and training is compulsory” for anyone over the age of 15. Military service is mandatory for Muslims and is optional for non-Muslims. However, non-Muslims must fight “under the banner of the Muslims” and not as a separate unit and cannot participate in a war against Muslim rivals. It’s okay for Muslims to kill other Muslims in war, but it is not okay for non-Muslims to kill Muslims in war. HUT repeatedly declares its commitment to non-violence but, again, there are important exceptions. “Whenever the disbelieving enemies attack an Islamic country it becomes compulsory on its Muslim citizens to repel the enemy. The Hizb ut-Tahrir in that country are part of the Muslims and it is obligatory upon them to fight the enemy and repel them. Wherever there is a Muslim amir who declares jihad, the members of Hizb ut-Tahrir will respond in their capacity as Muslims in the country where the general call to arms was proclaimed,” HUT’s website explains. In other words, Sharia is only appropriate for Muslim-majority countries, so a Sharia-based America is a long-term goal but not a present task. HUT uses the U.S. as a launching pad to lead the worldwide Muslim community and achieve a resurrected Caliphate that can overpower the U.S.
“Hizb ut-Tahrir is determined to work within the Ummah in order to implement Islam and achieve its objective by endeavouring to gain the leadership of the Islamic Ummah so that she could accept it as her leader, to implement Islam upon her and proceed with it in her struggle against the Kuffar and in the work towards the return of the Islamic State as it was before, the leading superpower in the world,” its website says. The criticism of HUT by Zaid Shakir, a popular Islamist imam in America who preaches that the U.S. Constitution is inferior to Sharia, is illuminating. He tells Muslims not to “vilify” HUT. His disagreement with the radical group is limited to its criticism of the Muslim Brotherhood and its overconfidence in the Caliphate to solve all of the Muslim world’s problems. This light treatment of HUT stands in sharp contrast to his treatment of America. On June 21, the founder of HUT in Chicago declared in Jordan, “Let Britain, America, and the entire West go to hell, because the caliphate is coming, Allah willing.” Shockingly, the Argosy University-Chicago uses him as an adjunct professor and he is a Visiting Research Scientist at the University of Illinois at Urbana-Champaign. That does not mean HUT should be forgotten about. It has a major international network that holds large rallies around the world. It even held a 1,000-strong pro-Caliphate demonstration in the Ukraine. Its website lists branches in the U.S., Britain, Australia, France, Germany, Spain, Denmark, the Netherlands, Ukraine, Russia, Turkey, Indonesia, Egypt, Pakistan, Palestine, Lebanon, Bangladesh, Malaysia and Morocco. HUT has expansive resources, it just hasn’t chosen to invest them heavily in America…yet.